CPAP mask and water chamber, also known as a humidifier. In fact, Lumin promises to have your equipment cleaned in no more than five minutes. Why is it so important to have a good cleaner for your CPAP? During the night, the components of your CPAP machine are exposed to moisture along with warm air. Any excess water that is left behind after use can produce mold and other pathogens, and breathing in harmful bacteria is not the ideal situation you want to be in. Lumin uses the same technique as hospitals use for patient and operating rooms to ensure you get the best results. Ultraviolet C (UVC) light is the main cleaning component in the Lumin chamber. The ‘C’ basically stands for the wavelength of the UV light that is emitted (200-280 nanometers for UVC). Though UV is dangerous for humans in large quantities, UVC poses no threat. A special mercury lamp inside of the chamber emits these rays. Polished aluminum lines the chamber and causes the light to reflect and cover a larger area. Once turned on, the light eradicates any sort of micro-sized pests that may collect on your mask or inside of your humidifier. Thanks to the fast-acting UV rays, all this disinfecting can be done with extreme efficiency. 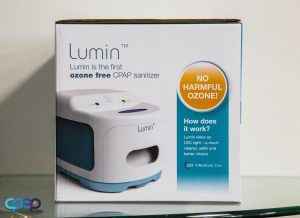 Lumin CPAP cleaners are notorious for implementing UVC technology used in hospitals into a small container. But what exactly is Ultraviolet light and why does it help with killing bacteria? Hold onto your hats, because this is about to get a little sciency. UVC has a very short wavelength as stated before. Regular UV has a wavelength of 10 to 400 nanometers. This means it falls above the normal light spectrum, the highest being violet with a wavelength of 380 to 420 nanometers, hence the name “Ultraviolet.” UVC changes the genetic makeup of bacteria by breaking the molecular bonds which hold the bacteria together. After the UVC splits the bacteria, a specific chemical which we won’t go into here intervenes and disables the organism. While this seems very complicated, the whole process occurs within the five-minute Lumin cycle, and in the simplest terms, it cleans anything you want. The reason Lumin CPAP cleaners use UVC light as opposed to a different cleaning solution is for health and safety reasons, along with simplicity’s sake. UVC gives off no harmful gases and leaves no residue to clean up after the cleaning process is complete. The Lumin cleaner does all of the work for you. In terms of the bulb, you are never required to charge It. However, like every tech item, things can malfunction, break, get destroyed, etc., and replacement bulbs are available at reasonable prices. By far the most harmful thing that UV can produce is Ozone (O3). Ozone is a toxic gas which smells very strongly. Along with its strong smell, ozone combines with oxygen in the air which makes it unstable on a chemical level and dangerous for your respiratory system. Now you may be thinking, what about the ozone layer? You are right; we do have a layer of ozone surrounding the entire Earth that protects us from the harmful UV radiation given off by the sun. However, in the stratosphere, it helps us, but on the Earth’s surface, it harms us. The Lumin produces no ozone whatsoever and is very safe to use in your home as UVC is entirely different from regular UV light. Lumin is among the best when it comes to cleaners for your CPAP equipment. It’s very safe to use with no reason to be concerned about using UVC light. We guarantee that the light given off does not emit any bad odors, stains, etc. Lumin disinfects whatever you put in the chamber in no time, and is also very affordable at just $249. You can even lower the price by using coupons. Stop researching cleaners and go Lumin. With everything you need all bundled into one simple machine, there is no reason not to buy a Lumin CPAP cleaner.